Bucks County, PA #rug store Brandon Oriental Rugs dresses rooms. Here's a #demo of an elegant change of room "attire" performed for our #LowerGwynedd customer. Your home is your work-of-art where meaningful dramas of every kind occur. Following examples from famous artworks, movies, and stage performances consider a fine quality rug from Brandon Oriental Rugs to set the stage for your performance. Handmade oriental rugs are often prominently seen in artworks. They are found as props on movie sets and in television shows. They are seen too in many stage productions: plays and concerts. 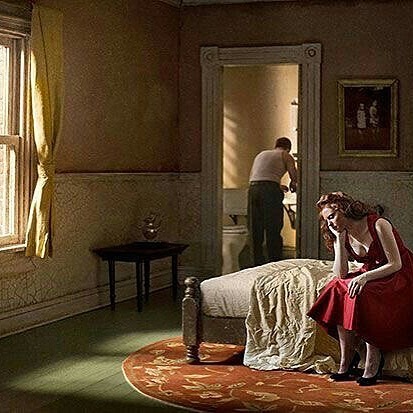 Since your home is very much your own "work-of-art"; a place where meaningful dramas of every kind occur, consider following the examples you see in famous artworks and artistic productions. Consider placing something truly beautiful and distinctive on the stage you walk in life. Think about a fine quality oriental rug as the place you will be when great scenes happen in life. Set the stage with greatness. 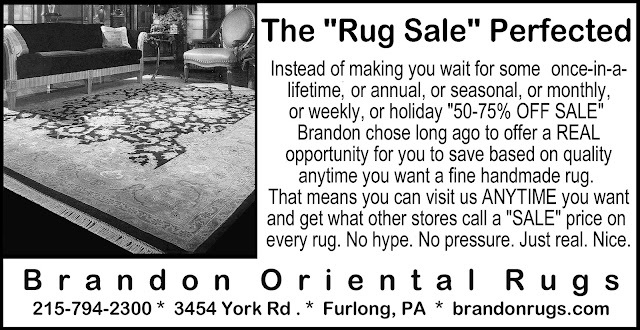 Bucks County, PA rug store Brandon Oriental Rugs - www.BrandonRugs.com - has a knack for helping you find beautiful rugs for inspired stagecraft in the home. #BucksCounty PA #rugstore Brandon Oriental Rugs - www.BrandonRugs.com - provides a quick #demo about how to improve the #looks and #style of any room by #dressing #naked #floors with #REAL #handmade #rugs. #BucksCounty #rugstore Brandon Oriental Rugs decorated for #Inauguration Day 2017. (Since we opened our present location in 1995, we have displayed the #Stars-and-Stripes on every Inauguration Day.) We are grateful for our great country, our Constitution and our time honored institutions and ceremonies. May the LORD God bless the United States of America with peace and prosperity. 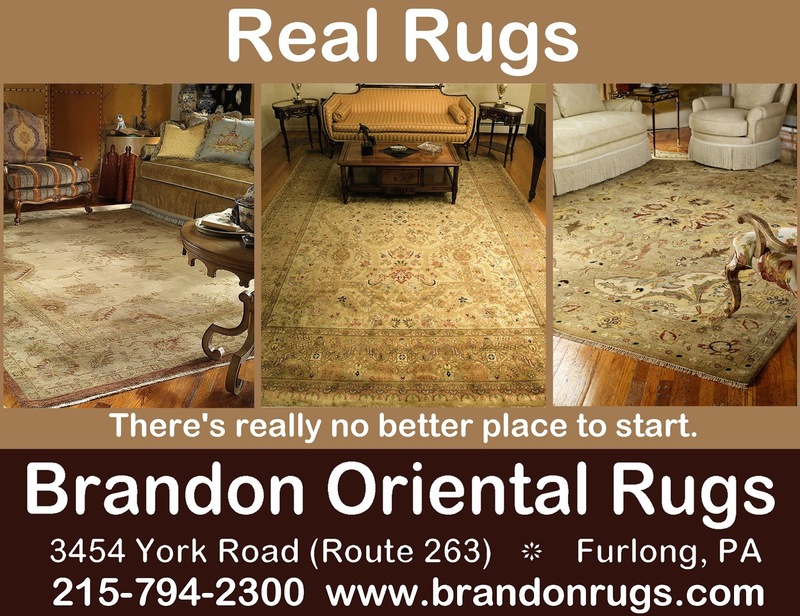 Bucks County, PA #rugstore Brandon Oriental Rugs - www.BrandonRugs.com - is a complete service for fine quality rugs (specializing in hand-knotted oriental rugs). 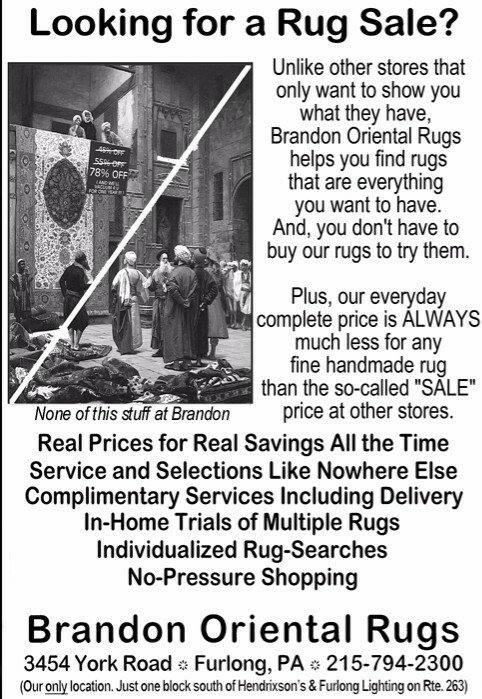 Brandon offers sales, cleaning, repair and appraisals of all fine area rugs (including new and antique; Persian, Turkish, Turkoman, Indian, Chinese; flatweaves and needlepoint; custom area rugs.) Other specialty services including stairway runner installation, personalized Rug-Search (tm) service, and professional design consultations regarding rug selection and collecting are available. Established in 1990, Brandon has served the metropolitan Philadelphia, South Jersey, Central New Jersey, and Lehigh Valley region from its store located in Furlong (Buckingham Township) since 1995. 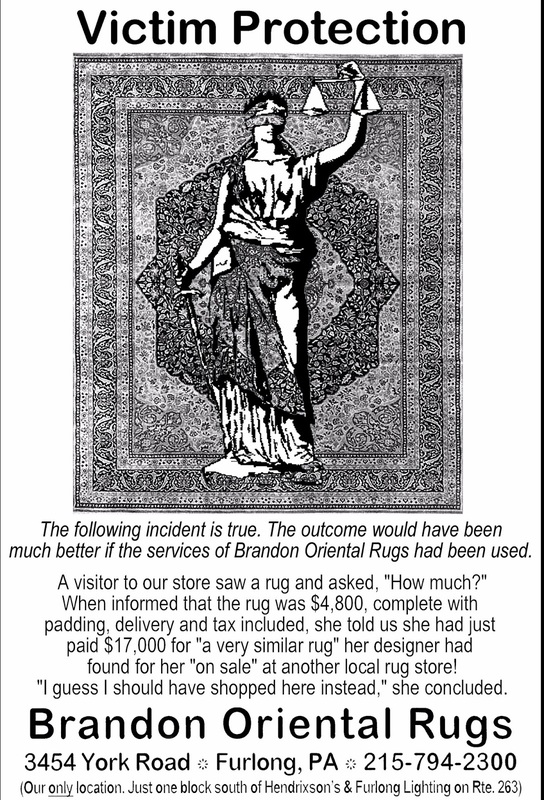 Brandon Oriental Rugs invites you to look at the real choices you can make to improve your home. A real handmade oriental rug is always a choice for the best; a choice forward in the right direction for interior design with integrity and elegance. Over more than twenty-five years, Brandon has developed considerable expertise in rugs and design that it is our pleasure to share for the benefit of all interested in oriental rugs and their use for bringing lasting beauty and elegance to home or office. We have seen many changes in culture, fashion, style, and taste over many years. In all that time, with all the change, our enthusiasm for the distinct benefits of REAL rugs has grown; and our philosophy about how to serve our customers has NEVER changed. The following images of newspaper and magazine ads published by us (back when that was the way media was offered) show what we still believe to be true about how to dodge "sale" hype and get to what is real. If you are ready to "GET REAL" about fine quality area rugs, we are here to assist you. BrandonRugs.com - Do the #math. A Quarter is roughly equivalent to one square inch. Each vertical ridge is a line of hand-tied knots; and (though harder to discern) rows of knots are stacked horizontally. This rug is nominal 13/13 construction (= 169 knots/sq.in.) Now figure out the number of knots in a room size rug and see if you can figure out how long it takes to make a #REAL #hand-knotted #orientalrug. (Probably not something you'll want to try alone at home.) When you discover how little they cost relative to how long they take to #make you will possess a new definition for #incredible #deal . Our customer in Warrington, PA inherited several hand-knotted oriental rugs from his father that were made in Kerman, Iran about forty years ago . One of the rugs, approximately 10x10 square, suffered severe moth damage while in storage following sale of the parent's home, and our customer asked Brandon for an inexpensive remedy. Reweaving of such a large area of pile loss (as seen in the second image - above) would have been quite costly; and unjustified relative to the rug's resale value at present. Still, our customer hoped to be able to use the rug in a second home he owns, and desired some kind of cosmetic improvement in the rug's appearance if possible to permit it. 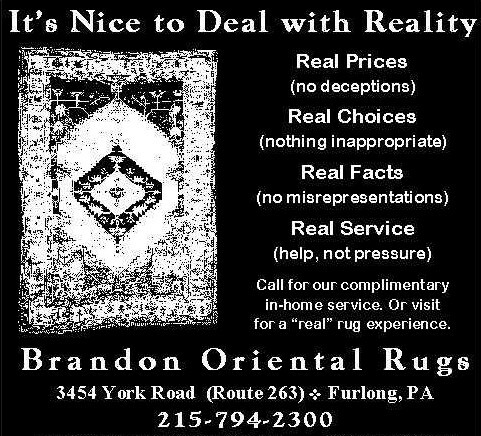 Brandon Oriental Rugs (which offers rug cleaning and rug repair services for oriental rugs to customers in a large region surrounding Bucks County, PA) consulted with numerous rug artisans to see what might be possible. The option chosen by our customer is to have the rug reduced in size by cutting off the entire border outside the outer guard stripe. This completely eliminates the damaged section, and the need for any reweaving or pile replacement. After cutting, the edges will be bound all around (per the third image below) and a replacement fringe sewn to the ends to protect them and restore the original look of the rug. This repair is a fractional cost of that to reweave the sections that were moth-damaged, and provides a rug that still looks beautiful and offers an extended period of use (with pride) in his home. Old, worn and damaged hand-knotted rugs do NOT need to be trashed. Extended enjoyment of them is possible via use of a number of remedies; many of them economically justified. Resolutions Are Easily Made and as Easily Broken. 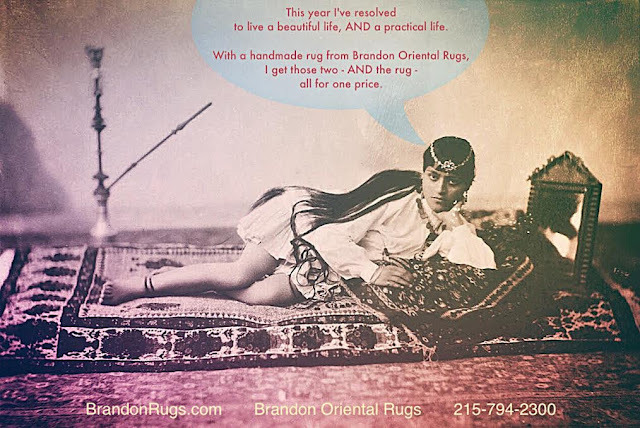 Bucks County, PA Rugstore Brandon Oriental Rugs - BrandonRugs.com - makes "I WANT IT ALL" resolutions EASY TO KEEP; for this year and for many years to come. We're all familiar with the success mantras: "Become the best version of yourself." "Do What-Ever It Takes." "Settle for More", and the like. With that in mind we make resolutions for ourselves (especially at the beginning of every year) to take the steps needed to make things better. We find that resolutions are easily made and as easily broken. But, Bucks County, PA rugstore Brandon Oriental Rugs - www.BrandonRugs.com - by offering rug solutions for your home and office that really are enduring improvements helps make your "I WANT IT ALL" resolutions EASY TO KEEP; for this year and for many years to come. Traditional, fine quality oriental rugs are often found in pictures of what success looks like. If a beautiful and a practical life is something you look forward to enjoying, bringing real rugs into your home is one of the better ways of looking and feeling like you are becoming the best version of yourself. For over twenty-five years Brandon (located in Central Bucks County, PA and serving a large surrounding area in Pennsylvania and New Jersey) has helped customers find beautiful AND practical rug solutions for their homes and offices.